John Wycliffe: The Morningstar -- "John Wycliffe" is a dramatic biography of the life of the 14th century scholar and cleric who translated the Bible into English for the first time. Martin Luther -- The dramatic black and white classic film of Martin Luther's life made in the 1950's. This film was originally released in theaters worldwide and nominated for an Academy Award. A magnificent depiction of Luther and the forces at work in the surrounding society that resulted in his historic reforming efforts. 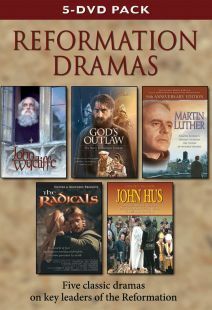 This film traces Luther's life from a guilt-burdened monk to his eventual break with the Roman Church. 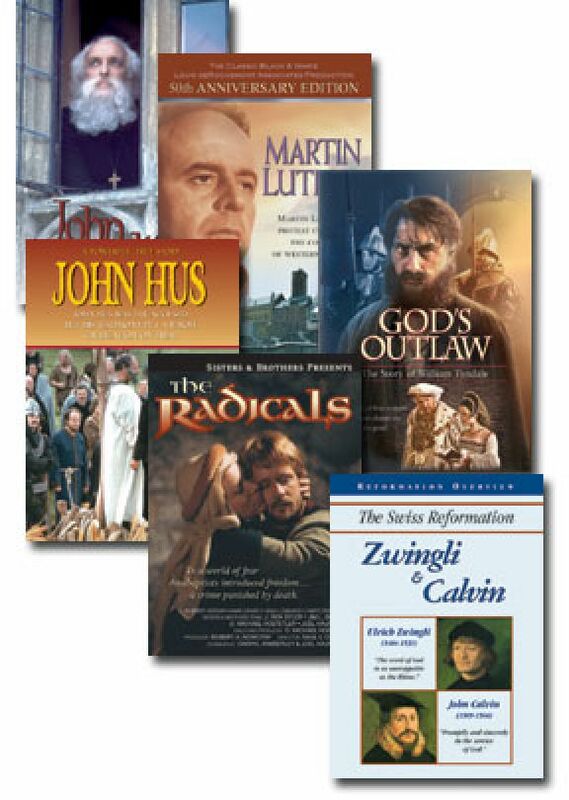 This film, in spite of its age, continues to be a popular resource to introduce Luther’s life. the making of the film and biographies of the actors. God's Outlaw: The Story Of William Tyndale -- A true story, God's Outlaw is about international politics, church intrigue, cold-blooded betrayal, and false justice ending in a criminal's death. But it's also about victorious faith and spiritual triumph over some of the greatest political and religious forces known in the 16th century. A simple God-seeking man, William Tyndale somehow became one of the most wanted men in England and all of Europe. Pursued by King Henry VIII, Lord Chancellor Sir Thomas More, and the Pope's personal legate Cardinal Wolsey, he darted across Europe to avoid capture -- always pushing to complete the task that obsessed him. John Hus -- Here is an important chapter in the steps leading up to the Reformation. The history books make little mention of this Bohemian priest and scholar who lived 100 years before Martin Luther and the Protestant Reformation. Yet, John Hus was convinced and taught openly that the Bible should be presented in the language of the people, that salvation comes by faith in Jesus Christ, and the Word of God is the final authority. He taught in the University of Prague and as a pastor, challenged the abuses of medieval Christendom. Intrigue and false promises weave a powerful story of one man's commitment to faith in Jesus Christ. He was summoned to the Council of Constance and promised safety, but he was betrayed. In the end, Hus was accused, imprisoned, and charged with heresy. Ultimately, he was condemned and burned at the stake as a heretic. - 55-minute version in English, Spanish, Portuguese, and French, with or without English subtitles. 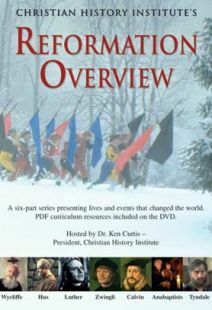 - Study materials in PDF format -- Christian History magazine article on Hus, study guide pages from Reformation Overview. Radicals -- The year is 1525. Michael and Margaretha Sattler have fled their religious orders. Their quest: restore the church to the purity of its early days when communities of believers practiced peace, compassion and sacrificial love. In 1527, Michael is burned at the stake and Margaretha drowned. But their movement survives and today is carried on by the Mennonites, Mennonite Brethren, Brethren in Christ, the Hutterites, and the Amish. WARNING: Contains some graphic depiction of historical persecution. Viewer discretion advised. 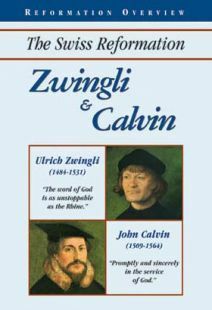 Zwingli And Calvin -- This program covers the 16th century Swiss Reformation, its key centers of Zurich and Geneva, and its central leaders, Zwingli and Calvin—two theologians who led tumultuous lives. Zwingli questioned major teachings of the church and instituted sweeping reforms. He sought to apply the Word of God for the transformation of civic and church life. Calvin laid the foundation that made Geneva a unique international center. He wanted only the quiet life of a scholar but was thrust into a critical role in Reformation and theological leadership.